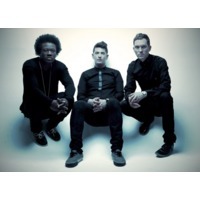 Magnetic Man is an electronic music project consisting of dubstep producers and DJs, Benga, Skream and Artwork. According to BBC Music the three artists are "legends of the dubstep genre". The trio first met in the late 1990s at the Big Apple Records store in Croydon, England. They perform using three computers, one playing drum samples, one playing basses and the third playing leads and samples. Artwork controls the master laptop, to which the other two are synchronised via MIDI. Their sets usually consist of a mix of original tracks produced together, and live remixes of Benga and Skream's tracks, accompanied by synchronised projected visuals by Novak Collective. They signed to Columbia Records in February 2010. Magnetic Man completed their first full length sellout tour on 5 November 2010. Their first album was released through Sony by Columbia Records on 10 October 2010.